Effects: antidepressant, up-lifting, anti-inflammatory, antiseptic, regenerating, deodorizing, toning, improving the general skin complexion, increasing mental and physical activity, stimulating blood and lymphatic circulation, helping to normalize the menstrual cycle. 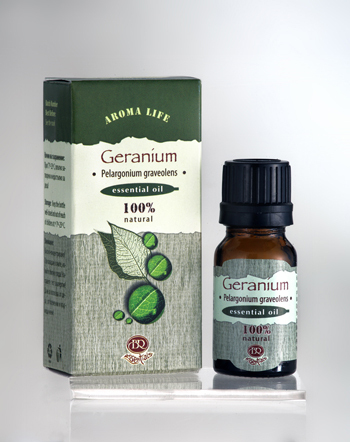 Benefits: Geranium essential oil has a fresh, floral, warm and up-lifting balmy aroma. It comprises a great variety of active components determining the various effects of the oil. Positively affects the nervous system, eliminates depression and anxiety. Stimulates neuro-psychic activity: enhances efficiency, mood and attention. It is a valuable skin-care essential oil, beneficial for dry, sensitive and damaged skin: it helps balancing sebum production, delays the formation of wrinkles, and has anti-inflammatory effect. Effective for varicose veins and hemorrhoids - helps eliminate inflammation, swelling, spasms and painful syndromes. The effect of this oil is beneficial also in various gynecological diseases. Relieving fluid retention, it is helpful in edema and overweight. One of the most useful essential oils to detoxify the lymphatic system and to help cellulite elimination. Blends well with many other oils, especially lavender, basil, rosemary, rose, neroli, sandal, juniper, lemon, jasmine, orange. Use: aromalampa, inhalation, air fresheners, bath, massage. Attention: Contraindicated for epileptics, hypertonic patients, people with low blood sugar, children, nursing mothers, pregnant women, in case of contraception acceptance, as well as for people with individual intolerance to the oil.